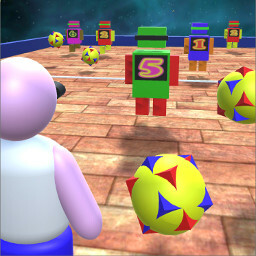 Dodgeball: Avoid the bouncing balls thrown by the robots, and try to hit them by throwing your own balls. You are the last member of your dodge ball team, playing against the galactic champions who just happen to be a mechanical bunch of robotic androids. You really are the underdog in this dodgeball competition. You will need good reflexes, high speed, great eye coordination and a whopping dollop of luck! Play flat 2D mode like the original arcade games, or tap the camera icon to zoom in on action and play from several different camera angles including 1st and 3rd person modes. To get to the next level you must avoid being hit and take out all the robots. When a robot is hit it is simply teleported off the court. This is a friendly competition, nobody is getting obliterated today. Star : Auto aim on. You start with 3 lives, but will get bonus lives, every 5000 points. Throw ball controls - Tap on the board, or on a robot to throw a ball in that direction. Tap off the board to throw straight ahead. Hold finger down to keep throwing. That's it, easy - Download "Robotic Dodgeball" now.